Enter email address to reset your password. In today’s digital age, Social Impact Institutions have the opportunity to accelerate achievement of their core missions. Advances in ICT allow the social impact ecosystem to interact in new and innovative ways leading to improved fundraising, fund administration, operational efficiency and transparency in outcomes. Avasant understands both the strategic imperatives and operational challenges Social Impact Institutions face and we offer a suite of customized consulting services drawn from cross industry best practices to help modernize technology driven operations within the social impact ecosystem. 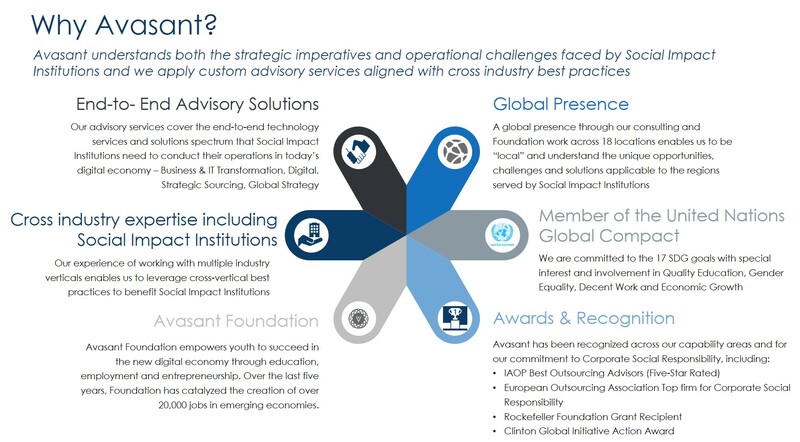 Avasant’s advisory capabilities, global operational presence, understanding of the unique operational and financial challenges Social Impact Institutions face and our commitment to development goals through Avasant Foundation make us a trusted partner for Social Impact Institutions embarking on a transformation journey. Avasant assists Social Impact Institutions address the challenges of driving efficient fundraising and administration, streamlining and scaling global operations and providing greater transparency of outcomes through technology-enabled transformation which is a key element of sustainable development. Avasant understands both the strategic imperatives and operational challenges Social Impact Institutions face and we offer a suite of customized consulting services drawn from cross industry best practices to help modernize technology driven operations within the social impact ecosystem consisting of iNGOs, CSOs, Foundations, Development Finance Institutions, governments, educational institutions, service and product vendors, individual donors and ultimately beneficiaries. 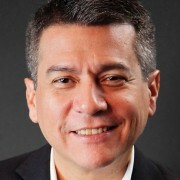 To achieve the mission of helping 100 million girls learn, lead, decide and thrive, Plan International executed an intiative to optimize IT spend and refocus the IT organization from day to day IT operations to the planning and execution of more strategic IT initiatives to better serve global internal and external stakeholders. Avasant recommended an IT services strategy with optimal sourcing scenarios, future state delivery model and execution roadmap aligned to achieve business outcomes.